FBP aims to be the principal international journal for publication of high quality, original papers in the branches of engineering and science dedicated to the safe processing of biological products. It is the only journal to exploit the synergy between biotechnology, bioprocessing and food engineering. Papers showing how research results can be used in engineering design, and accounts of experimental or theoretical research work bringing new perspectives to established principles, highlighting unsolved problems or indicating directions for future research, are particularly welcome. Contributions that deal with new developments in equipment or processes and that can be given quantitative expression are encouraged. 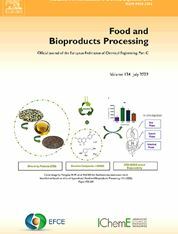 The journal is especially interested in papers that extend the boundaries of food and bioproducts processing. • Containing only chemical analyses of biological materials.